I know. I know. 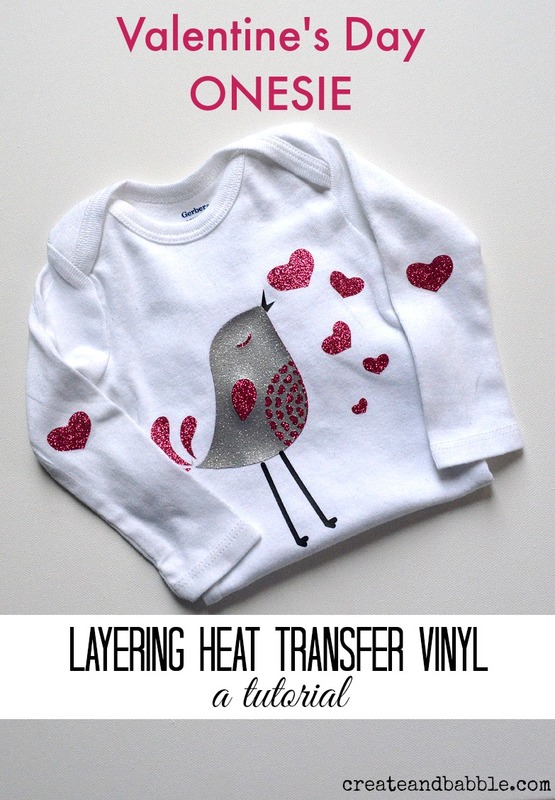 I was just saying recently how heat transfer vinyl (HTV) is not just for onesies. So what did I just make? Yep. A onesie. 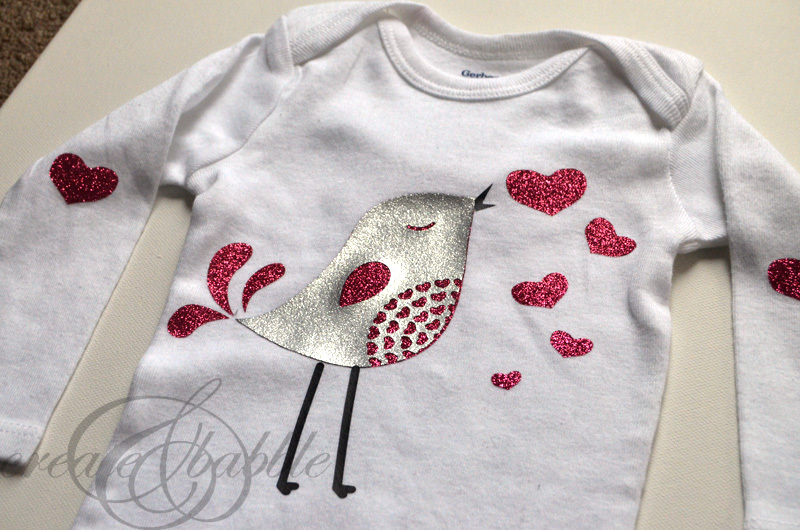 But this Valentine’s Day will be my granddaughter’s first Valentine’s Day and I just HAD to make her a Valentine’s Day Onesie. 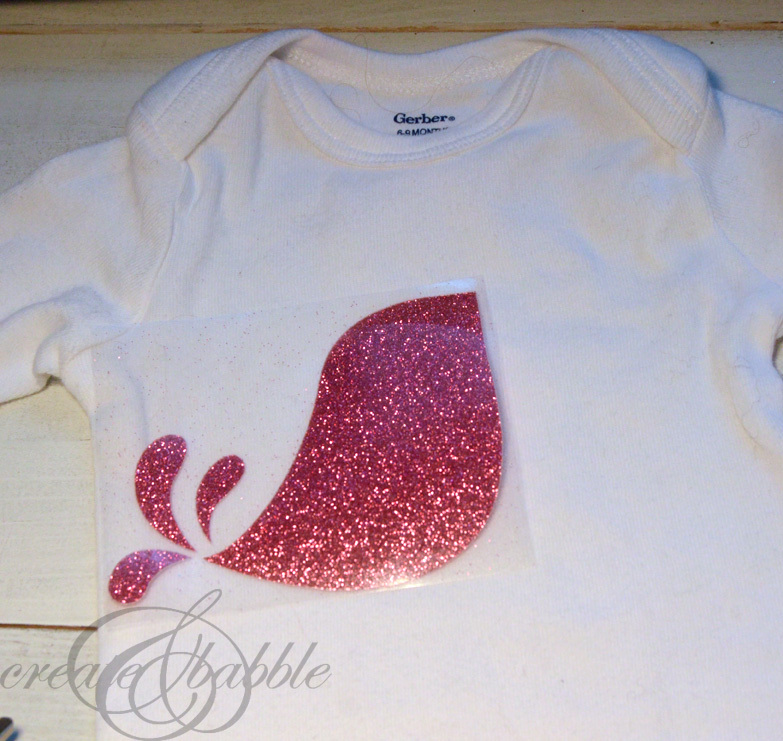 I cut out the shapes using my favorite HTV (glitter HTV from Specialty Graphics). If you’ve been a reader here for a while, you know I just love this stuff. 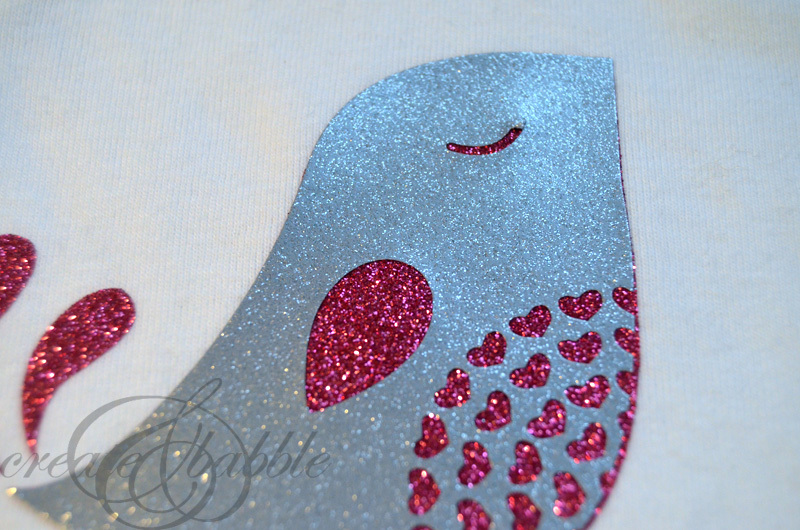 See more glitter vinyl projects here. 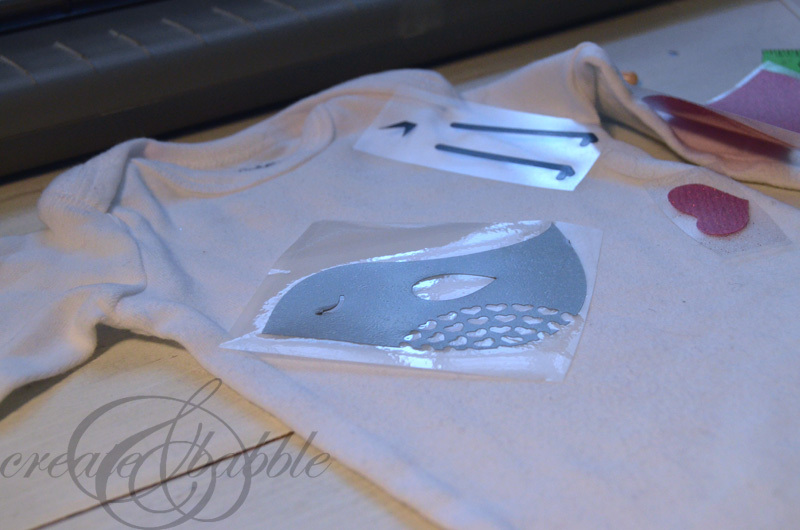 I pressed on the solid bird shape on the onesie first. MISTAKE: I should have made that shape just a teensie bit smaller by using the offset tool. You’ll see why in a minute. 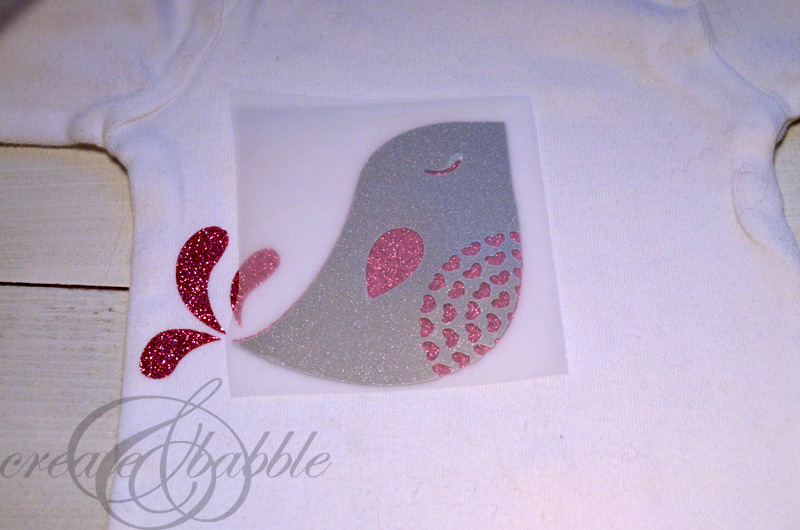 Next, I placed the bird shape with cut outs on top of the solid bird shape. Here’s where you can see my mistake. It’s almost impossible to line up the second layer perfectly over the first. If I had made the first shape a little smaller, it wouldn’t be peeking out at the edges. Lesson learned. Just one heart just wasn’t enough so I replicated the heart that was in the original cut file a few times and adjusted the size. I also added a heart to each sleeve to mimic elbow patches. I guessed at the placement of those. As you’ll see in the photos below, luck was on my side that time! 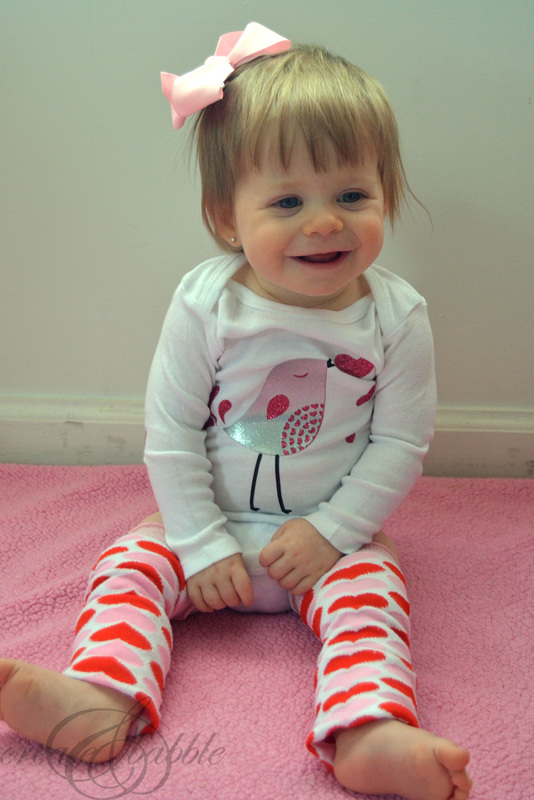 And here’s sweet, little, 11-month old Melanie, modeling her new Valentine’s Day Onesie! But she didn’t sit still for long . . .
. . . and she’s off to explore. I went through every Rivka Williams design and could not find this file, or by the name of “Love Bird” 🙁 Can you double check for me. 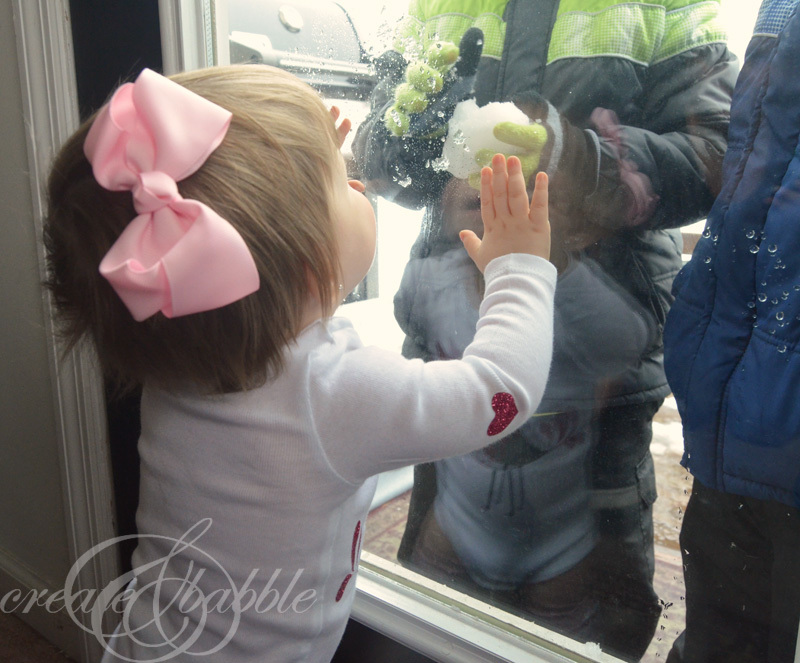 I want to make this for my Granddaughter. Thank you. I am not able to find this sweet bird in the Silhouette website. 🙁 I really, really want to make one. Suggestions for finding it. I have searched all over the internet.